Good news! Here’s a set of free printable January 2017 calendar that you can print and use outright. Yup, it’s about time to plan the first month of the new year ahead. Isn’t that exciting? Cheers to a beautiful start! 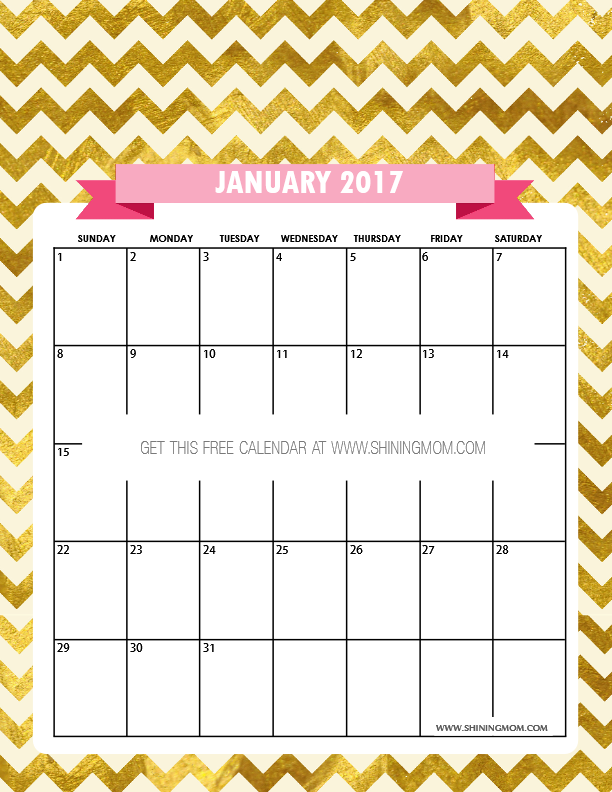 If you’re searching for a free printable January 2017 calendar to print, look no further. Here are some new designs for you to choose from! If you’re wondering if I will again release 2017 monthly calendar sets on the blog just like the previous years, my answer is a loud YES! This set of free printable January Calendars is the first of the twelve monthly calendar sets I’ll be sharing year-round! New on the blog? I’m so glad that you have found your way here! 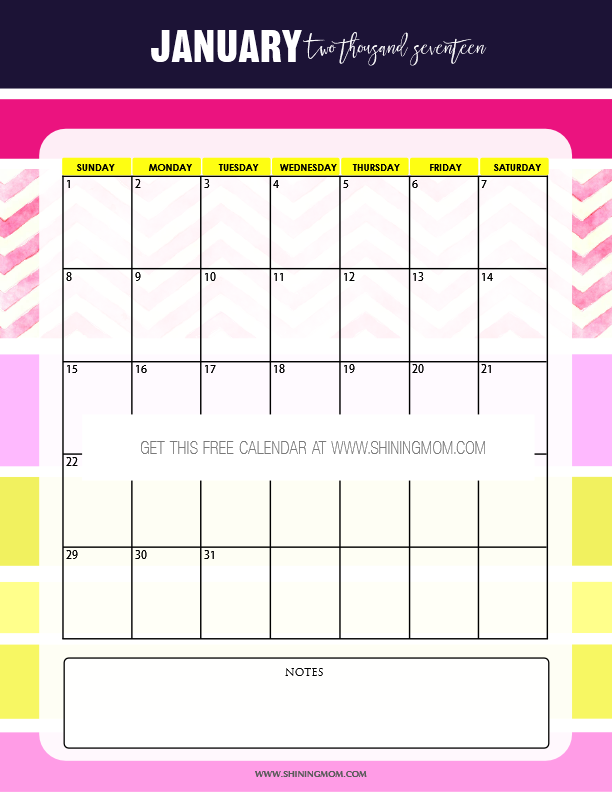 Please know that FREE PRINTABLES are huge part of Shining Mom blog. 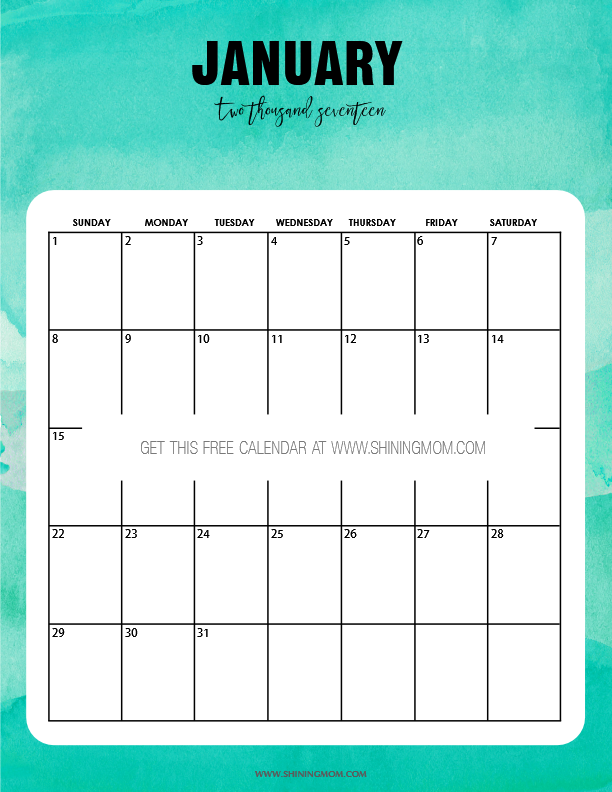 I share weekly freebies in my Happy Freebie Monday segment plus it has been a tradition here in Shining Mom to release a free planner and a calendar set monthly (yes, my readers are spoiled like that!). I hope you, too, can follow me along! With this set of printable January 2017 calendar freebie, I decided to go for a more cheerful vibe since it’s the beginning of the year. The colors are bold, bright and beautiful. Each design allows you to write your every day personal reminders with the white spaces allotted. Here then is the BIG unveil. Let’s have a quick calendar tour. Enjoy! This first calendar that I have designed is a perfect match to the very popular Shining Mom planner for next year. (Thankfully, my PLANNER has already been pinned and shared a thousand times by this posting!) What’s endearing about this first calendar is that it is a combination of colors that are sweet and happy at the same time. While I am using this calendar to go with my planner, this piece will also be great to pin at my workstation’s bulletin board. Where do you think you can use this one? 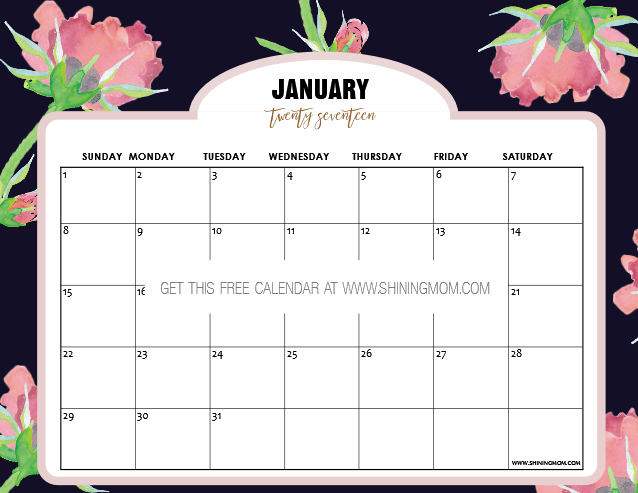 If you’re looking for a printable January 2017 calendar with an ample space for your personal notes and reminders, this lovely piece will make a great option to print. Fall in love with the hand painted flower element that I incorporated in the layout (which is a licensed purchase) plus the very functional calendar layout! This is one of my favorites from this set. I just love the watercolor flower painting over the charcoal grey background, they look so elegant together! I personally recommend that you use this pretty piece in your coffee table or in your kitchen for meal planning! I know a lot of you are still looking for a no-frill calendar to use for your every day planning… this next one delivers your need! 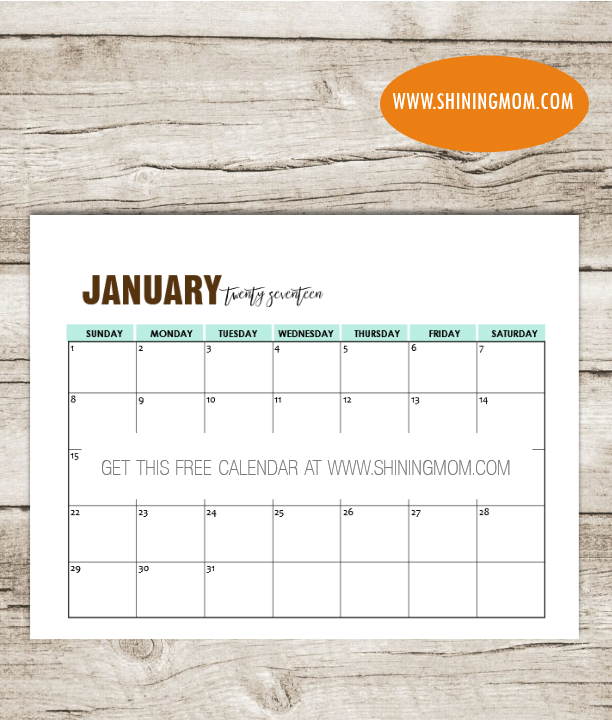 Pretty and understated, this free January calendar is perfect to use anywhere you like! Loving turquoise? I do, too! I love the refreshing vibe that this color exudes hence I created your next calendar in this background. Be sure to get this darling, textured cute January 2017 calendar! In case you would already like to get the first five copies which all come in PDF files, the calendars in landscape format are HERE while those in portrait are HERE! Now let’s continue to check more calendar previews! The next calendar in this set is a very lucky one that comes in gold foil background. Bright and sparkly, print this off for your kids or use this for party planning! You can also print this for yourself! 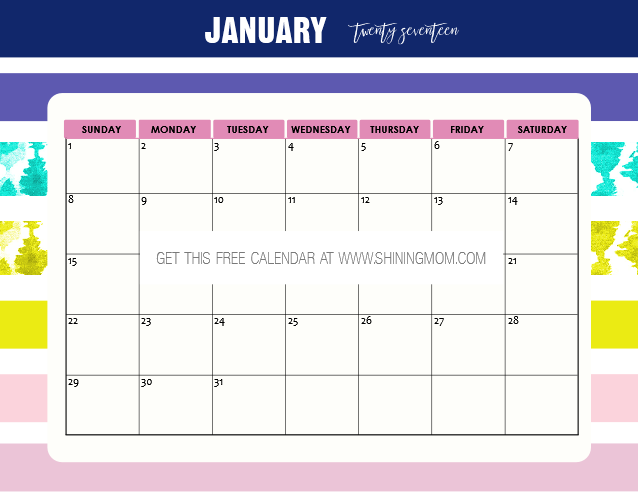 Free Printable January 2017 Calendar: Fun and Playful! 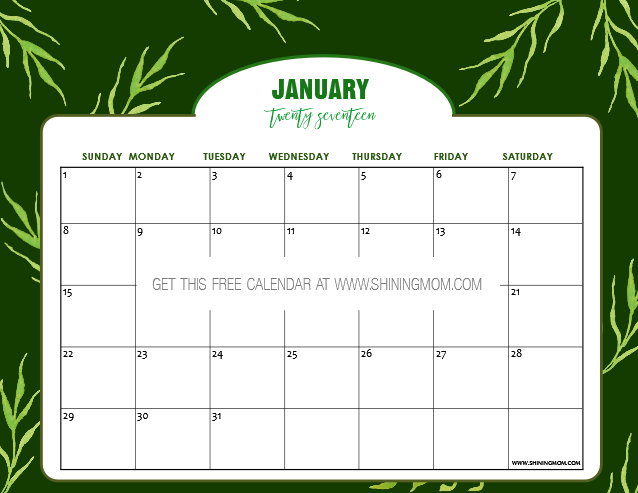 The next free printable January 2017 calendar in this set is a cute design that I think kids will love. It comes in fun and playful background! Get this calendar for your little school kids to include in their school binders. 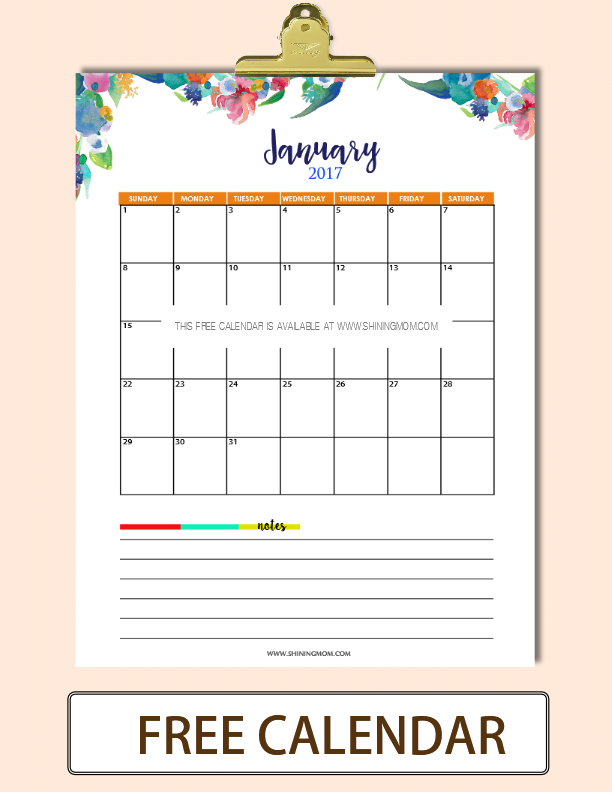 This free cute January 2017 calendar will be great to use to write their projects and homework! If you’re looking for a calendar to print that is inspired by the nature, here’s a refreshing design that you can also download and print. Where do you think you can use this? 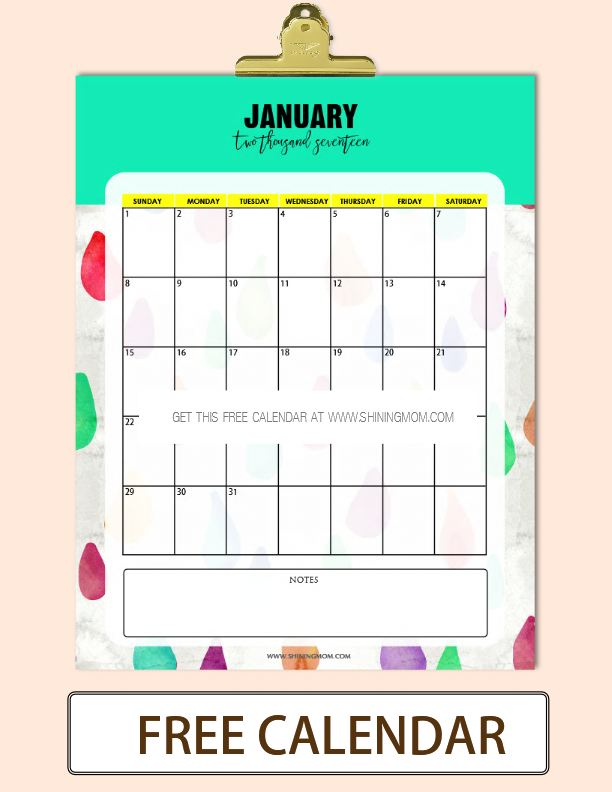 This next piece is hands down my favorite in this set of free printable January 2017 calendars. It is less on ink plus it looks so refreshing and fun to use! Well, actually, I have also previously shared a similar calendar on the blog which is already available for the months of January till December 2017. If you would like to see it, hop over HERE! The last calendar in this set is another design that’s a perfect match to the Shining Mom planner, but in portrait format this time. Just like the first calendar in this set, it comes in pretty and fun print! Should you have already snagged a copy of the lovely planner, be sure to get this calendar. It’s pretty! That’s it! 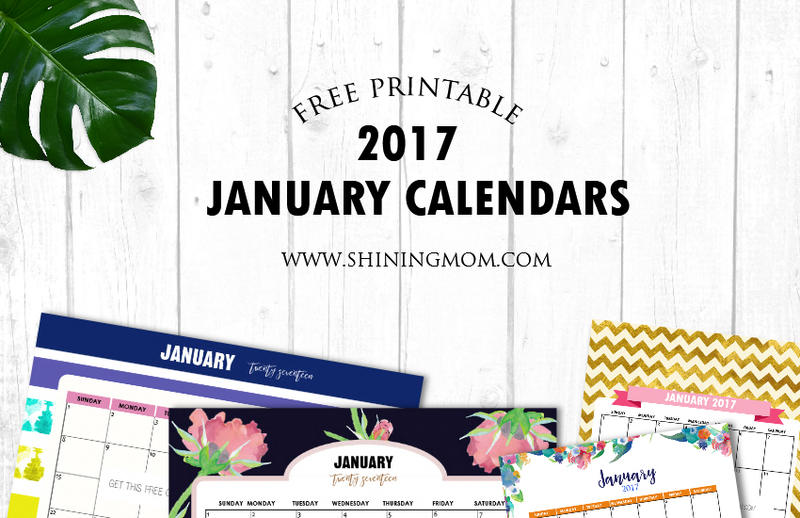 Ten free printable January 2017 calendars for you to choose from. Which designs would you like to use? Print two or three for yourself and some copies for your family, officemates and friends! Here then are the last four copies of the calendars. All copies that are in portrait format are linked HERE while those in landscape are HERE! In case you missed it, the links to the PDF files of the first 5 calendars are found towards the middle of the post! All calendars are designed to be printed in standard letter-sized paper, 8.5 x 11″, that is! I hope you can use them. Enjoy! May your 2017 be a happy and productive year! 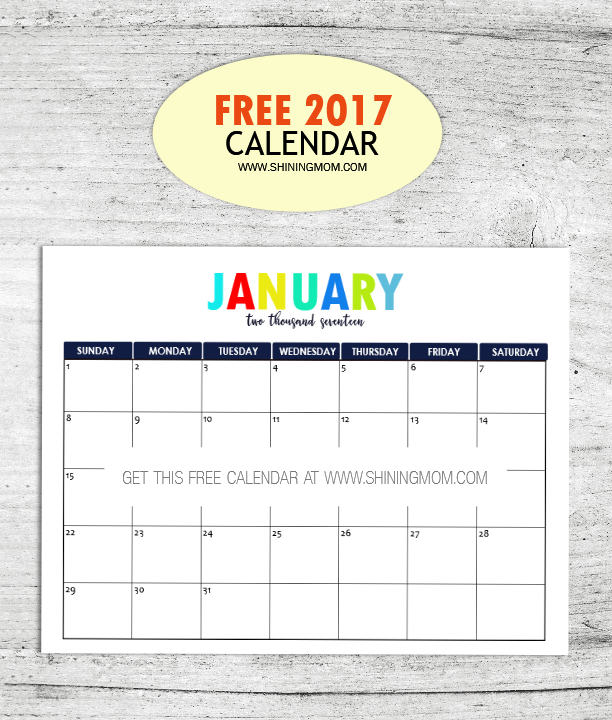 This set of free printable January 2017 calendars is copyright © www.ShiningMom.com. Each calendar is free for personal use only. Should you like to help me spread this freebie (I’d love you forever for that! ), only the topmost photo is allowed to be shared and please link me back directly to this post, not to the PDF download. Pinning any of my images at Pinterest is very welcome and much appreciated! « Kyle is Ready to Take on His Big Firsts!